WHAT: Restaurants, hair salons and spas tell ThinkNear when their businesses are usually slow and how much they are willing to discount. An algorithm uses this information plus variables like weather to generate and distribute mobile ads to drive customers during slow periods. Customers click on the ad to get the coupon (which has a tracking code), then show it to the merchant on their phone for the discount. Free three-month trial right now. The monthly fee of $99 guarantees businesses 5K impressions a month but not a certain number of customers or deals offered. Nightly emails report how many people saw their ad, how many clicked and how many claimed. Available only to merchants in New York. Los Angeles coming soon. LAUNCHERS: CEO Eli Portnoy and John Hinnegan, head of software engineering. Both worked at Amazon (but not together). Eli previously founded a company that matched low-skilled laborers like dishwashers and janitorial staff with employers. WHY: Big businesses have sophisticated tools and analytics for pricing, small businesses don't. Every local business has slow times, and daily deals like Groupon and LivingSocial aren't designed to attract customers when business is slow. Consumers don't need another app to download and check for deals. Small businesses have limited time to create and manage marketing campaigns. Difficult to measure ROI on phone book and other types of advertising. "We wanted it to be inexpensive enough that the ROI would be incredibly high from day one for merchants," says Eli. WHEN/WHERE: July 26, 2011 / Culver City, CA. BACKSTORY: Eli got to know small businesses from his first company, as the people he placed typically worked at restaurants, salons and spas. A mutual friend put Eli and John in touch after Eli said he was looking for a co-founder. ThinkNear was part of the first TechStars New York class in early 2011.
BUSINESS MODEL: Monthly subscriptions. ThinkNear does not take a cut of transactions. Eli says there could be a data product later on, but "at this point we're really trying to get this product right." COMPETITION: Daily deal sites like Groupon and Living Social, Yellow Pages, online ads and coupon mailers like Valpack. ShopKick targets local businesses but focuses on loyalty not slow periods. HOW THE ALGORITHM WORKS: Weather, holidays and events in an area can affect when businesses are busy or slow. Although Eli won't reveal all the factors used, he says, "Intuitively there are things you can think of. We're looking at intuitive ones and the ones that are less intuitive as well." Also, the targeting improves based on how many people click on an ad and use the discount. PARTNERS: Integrated with mobile apps including Socialite, OnDemandWorld, GeoQpons and Coupon Queen, as well as Where, the local-focused mobile ad network Ebay recently acquired. 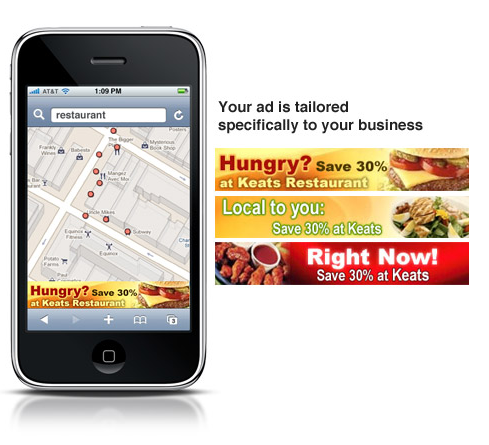 Actively courting mobile-app developers, who can use ThinkNear's templates for ads or design their own. PHILOSOPHY: Small businesses are the lifeblood of the economy. "We're passionate about helping local businesses thrive." ON THE DEAL INDUSTRY: Eli says he sees things that are right with the daily-deal system and things that need to be improved. "We've gone through the first inning of a nine-inning game. We've got everyone excited about using deals for local businesses. The second phase is helping them optimize and use new tools properly, and that's where we think we fit in," says Eli. HOW TECHSTARS SHAPED THE COMPANY: "It was instrumental. There aren't enough words to describe how much progress we made and how fast we were able to make progress because of TechStars," Eli says. ThinkNear has since transitioned from "a packed house of 11 startups doing incredible things to being out on our own," he continues, allowing them to develop their identity and culture. It is the only member of the NY class in Los Angeles. WHO BACKED IT: IA Ventures, Google Ventures, Qualcomm Ventures, Metamorphic Ventures, ff Venture Capital, TechStars. Angels include David Tisch and David Cohen of TechStars plus Matt Turck from Bloomberg Ventures. TOTAL RAISED: $1.73M ($1.63M Series A announced July 26 plus $100K seed from IA Ventures and $12K from TechStars). WHAT INVESTORS SAY: Ben Siscovick of IA Ventures says they led the seed and Series A because it's a sophisticated data-driven solution for local merchants that works when they need it most. About Eli and John: "Wicked smart, scrappy and ridiculously thoughtful. Plus they are just great guys. Exactly the type of founders we love to back." David Tisch, who runs TechStars New York, says, "Eli and John are some of the hardest working and insightful founders I have ever met. They have spotted an opportunity in a crowded market that adds value to all sides involved, merchants, customers, developers/publishers. Very excited to see them launch." NUMBER OF EMPLOYEES: 4 and hiring technical talent. Says John, "If you have experience building large systems, that's more important than the specific language you've used before." 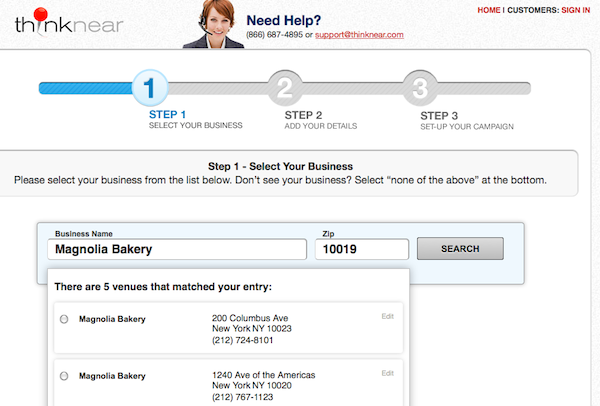 Merchants who want to sign up first enter their business name and zip code. Next, merchants give their details, including their type of business (e.g., restaurant), the average price of their offering, average capacity, operating hours, and their slow periods. Defaults for hours and slow periods is "closed" for each day, so merchants have to select times (this is the most time-consuming part of signing up). Finally, the merchant lists the highest discount it will give and its regular discount. Restrictions on discounts can include making it for new customers or only those above a certain age and not offering discounts on holidays. ThinkNear will follow up within 48 hours by email or phone to confirm the campaign. The merchant can see selections in each category and can edit if necessary. The mobile ad with the merchant's discount is created with a template but specific to that business.